"At your request, I am submitting my resignation," Sessions said in a letter addressed to Trump. "I have been honored to serve as Attorney General and have worked to implement the law enforcement agenda based on the rule of law that formed a central part of your campaign for Presidency," Sessions wrote, adding, "[T]hank you for the opportunity, Mr. President." Trump tweeted that the White House was "pleased to announce that Matthew G. Whitaker, Chief of Staff to Attorney General Jeff Sessions at the Department of Justice, will become our new Acting Attorney General of the United States." "He will serve our country well," the president noted. ​The development follows a historic round of midterm elections in which Democrats regained the majority in the House of Representatives, while the Republicans expanded their majority in the Senate. 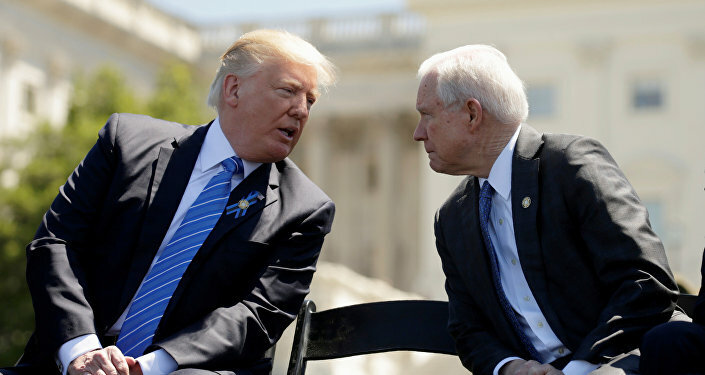 Trump has blasted Sessions during the former Alabama senator's tenure as attorney general for recusing himself from the investigation into alleged collusion between the Trump team and Russia, fueling speculation that Sessions' time in the cabinet was limited. With Sessions recused, oversight of the probe fell to Rod Rosenstein, Sessions' deputy. Jerry Nadler, the Democrat who will chair the House Judiciary Committee in the next Congress, has already tweeted concerns over change, asking "Why is the President making this change and who has authority over Special Counsel Mueller's investigation? We will be holding people accountable." A spokesperson for the US Justice Department clarified shortly after Sessions' resignation was announced that Whitaker would be responsible for "all matters" that fall under the department's purview, including the Mueller probe.